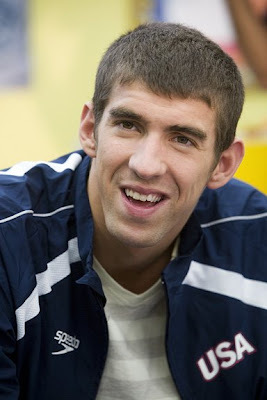 Olympic swimming champion Michael Phelps visited the Boys and Girls Club of Burbank today. He spoke to a group of children about his Olympic experiences and answered several of their questions. He told the kids that he had mostly rap on his iPod with "Young Jeezy" being one of his favorites. He also told them that he missed his dog which is back home in Baltimore. The entertainment media covered Michaels's visit en force. They queried Michael about his "celebrity crush" on "Lindsay Lohan." Word is that he is over that crush, and has moved on to a new crush with "Carrie Underwood." Michael rushed off for a taping at the NBC studios for the "Tonight Show With Jay Leno", and will host next week's "Saturday Night Live." He was also a presenter at the MTV Video Awards Show and shared a limo with music star "Kid Rock."